If travelling to Koh Chang and the islands or indeed onto Cambodia via the borders at Had Lek, Aranya Prathet and Ban Pakkad, you may well end up staying a night in Trat or near the departure piers at Laem Ngop for Koh Mak and Koh Wai and Laem Sok for Koh Kood. We have rounded up some of the best accommodation options for you. 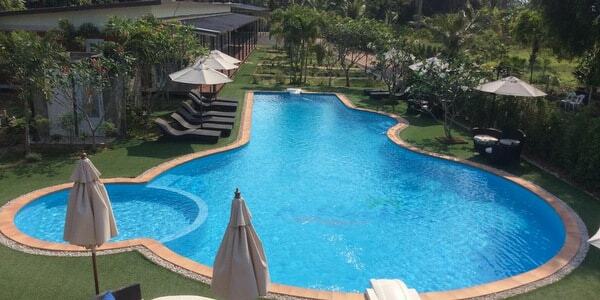 Trat hotels and guesthouses are a mixture of 3 star provincial hotels alongside some quirky resorts, boutique lodgings, motels and backpacker guesthouses. Chivapuri Residence is located centrally just 5 minutes from the bus station and within easy walking distance of the night market. It offers ensuite a/c rooms with TV and refrigerator as standard, with superior style from 900bt and family rooms from 1,300bt. With a restaurant onsite and wifi in the rooms and common areas, it’s a solid, dependable 3 star provincial hotel. 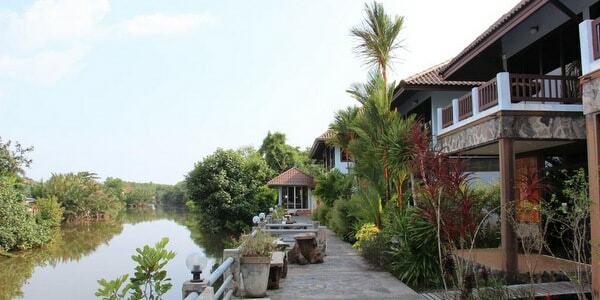 The sister resort is the highly recommended Chivapuri Resort on Bang Bao Beach in Koh Chang. Just after the main guesthouse area in the old town, Baanrimnaam Resort Hotel offers a selection of ensuite a/c doubles, twins and larger family rooms overlooking the river. Room facilities include wifi, TV and refrigerator. Breakfast is available. Noted for its efficient and friendly management, Baanrimnaam Resort Hotel’s pretty location by the water (pictured at top) makes it a popular draw. Rates from 800bt for a twin to 1,200bt for a deluxe double. In the old quarter of the town – home to many of the guesthouses – Rimklong Boutique Hotel is Trat’s only boutique offering. It is split into two parts at either end of a quiet back street, with just 9 a/c ensuite doubles complete with TV, refrigerator and wifi. No restaurant on site, but there is a coffee shop where you can get a simple breakfast and evening cocktails. Mr Tuu is the friendly host. Rates from around 1,000bt a night. Set back from the main road 5 minutes from the markets, the newly built Trat Center Hotel is a practical motel style spot, which offers good, clean comfortable a/c ensuite doubles, with TV, refrigerator and wifi. Breakfast and car parking are both available. 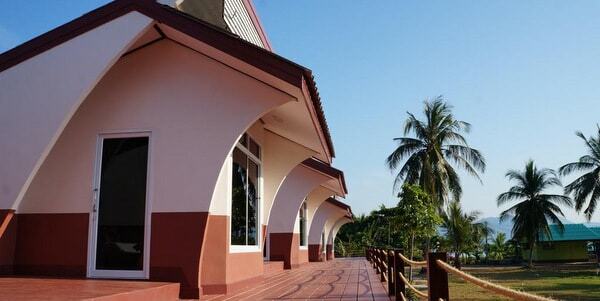 Trat Center Hotel makes a sound choice for an overnight stay on the way to or from the islands. Rates from around 900bt a night but good deals possible. Centrally located just off the main street, SA Hotel offer large a/c ensuite rooms with twins, doubles and triples. Breakfast is available downstairs in the restaurant or plenty of choices at the markets literally just round the corner. Wifi in the common areas, car parking on site. SA Hotel is one of the town’s longest running hotels, a no frills establishment which is more than adequate for a transit hotel. Prices from 500bt per night upwards. About 2km out of town, the quirky Hotel Toscana, designed in a mock Italian style, offers twin, double and triple a/c ensuite rooms set around a swimming pool. In-room facilities include TV, refrigerator, balcony and wifi. Breakfast is served but you will need to travel into town for other meals, a bit of a hike if on foot. As an alternative to the choices in town, Hotel Toscana is well worth a look, the chance for a dip in the pool an added bonus. Room rates from 800bt to 1,800bt. One of the original Trat guesthouses, Pop Guesthouse has changed over the years into a motel style with options of twins, doubles and family rooms either in the main area or across the road in other offshoots. All rooms have ensuite bathrooms with hot showers, can be a/c or fan and provide a TV (local cable) and wifi. The all day restaurant makes a nice spot to hang out with fellow travellers and its very easy too to purchase onward tickets to all destinations. Rates from 350bt upwards. 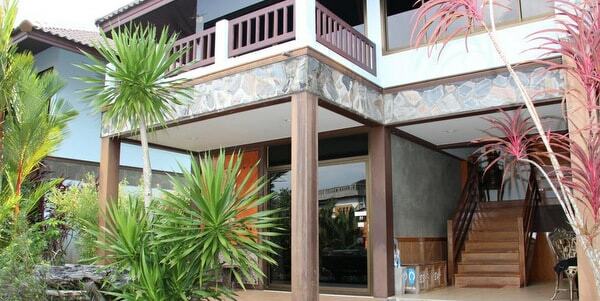 Pop Guesthouse is located at the top the street called Thana Charoen in the old town. Carry on down here and you will find a handful of other cheap places to stay either directly on the way or in the connecting sois. The esoteric Artist Place at the far end is a deservedly popular haunt, lots of cool design features to set it apart from the others. Basar too offers a couple of nicely styled rooms in its cleverly converted house. The German owned Residang Guesthouse has been a feature here for many years, more practical and less quirky than the others but still representing good value. On the parallel street, Orchid Guesthouse too is another one to look out for, set in its own pretty garden. Prices at these guesthouses start as low as 200bt, with shared bathroom. 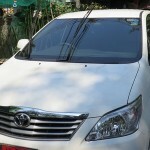 Rimklong Boutique Hotel, as recommended above, is also located in the same area. Laem Sok, some 30km outside of Trat, is the departure pier for Koh Kood. Unfortunately, the last daily boat in the high season is at 14.20 and in the low season at 13.30. If arriving into Bangkok on a later flight or coming from Cambodia, this may mean that you cannot make the connection for same day travel, so will need to overnight on the mainland. If you choose not to stay in Trat using one of the hotels above, there is now an option by the pier itself, Check and Chill. Check and Chill offers a/c twin and double rooms, ensuite with wifi, in a pretty garden setting with a large swimming pool, ideal to keep the kids occupied. Breakfast and dinner is available, the resort will book your boat tickets for you if needed. Rates from 1,200bt a night. Laem Ngop, some 20km outside of Trat, is the area of the departure piers for Koh Chang (Ao Thammachat and Centerpoint) and Koh Mak or Koh Wai (Laem Ngop Pier Krom Luang). The last daily speedboat to Koh Mak is at 16.00, the last ferry to Koh Chang at 19.30, so you may need a room in this area if arriving late. Owned by an American and Thai couple, Baan Saluda is just 5 minutes from Laem Ngop Pier offering a/c ensuite twin and double rooms in a large house by the water, with great views out towards Koh Chang. Breakfast is available and there are a few other restaurants in walking distance nearby. The owner will book your boat tickets for you if needed and organise the transport to the pier in the morning. Rates from 1,200bt a night. Located near to Ao Thammachat Pier for Koh Chang, Lomtalay Resort is a Thai style bungalow operation in a terrific spot overlooking the sea. Fronting a well kept garden area, accommodation is in large bungalows joined by a wooden terrace, double or twin beds with ensuite bathrooms, all a/c. Breakfast is included, western or Thai, but you do need to specify which you prefer. Dinner also can be arranged for late arrivals. The owner is happy to drop you at the piers the next morning either for Koh Chang or 10 minutes down the coast to Laem Ngop Pier for Koh Mak. Rates from 1,300bt a night.